On Friday we went into Tokyo, we had booked rooms at the Palace Hotel and planned to my in-laws there around 4pm. We actually arrived at Tokyo station at lunch time so we had lunch before checking in at the hotel, once we had checked in and Ebi-kun had checked the beds for bouncablility we headed out to find the cows. Ebi-kun loved spotting the cows, his favourite was the rainbow one, I really like the 2nd from the right although the one in the shower coat was funny too. We managed to spot quite a few but not all 80 or however many there actually are. Once we got everyone together we went out for dinner, we had planned to go to okonomiyaki but sadly it was already packed out so we went to a healthy food buffet instead, everyone seemed to enjoy it, Ebi-kun filled his boots! We got back to the hotel to find that Space-cadet had been living it up in our room. In Japanese hotels you usually get a bible and the writings of Buddah, which is quite an interesting read. Ebi-kun was shattered and went straight off to sleep after his bath, I wish we had got his own bed, he is like sleeping next to an octopus wearing hobnailed boots! For Saturday we had a trip to the toy museum and the Hobgoblin for lunch....more about that tomorrow. Thank you for the comments on the last post about the pin punching, I like the continent idea a lot and I think I will dig out an old cushion for him to use next time. 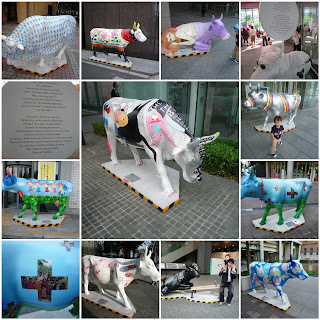 Love the Cow Parade! In Toronto, Canada, we had the same things, but with Moose!! Moose were placed all over the city, while driving around we would shout "There's another one!" every time we spotted one. A few are still around. They were awesome! I love anything hand painted, and I'm sure the cows were just as awesome as our Moose! They have the cow parade here in Budapest too, what a small world!